Cut Paper (13" x 7"). 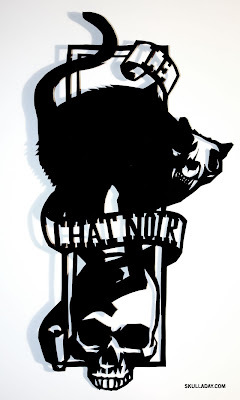 It seems appropriate that it's time for another cut paper installment, just as "Quoth The Skull..." is on the verge of winning the T-Skull elections by a landslide! [UPDATE: It did by 91 out of 154 votes] (Thanks to everyone who voted. I'll be making the new shirts just as soon as the current ones sell out.) And yes, there'll definitely be more in this series before the year is over. (Organic) Peanut Butter & Fruit Spread on (locally made) Bread. 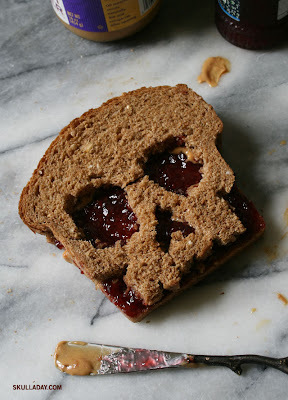 I appear to be on a food skull kick again (sorry, no cookies yet). My understanding is that this type of sandwich is not very popular outside of the US, is that true? And yes, I am eating this for lunch. P.S. 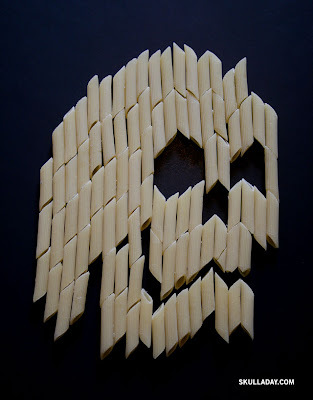 Skull-A-Day is featured in the special Halloween issue of MAKE magazine! Be sure check it out when it hits stands next week. p.p.s. To Rob: I tried using the sandwich box you gave me, but it didn't fit! There's still a chance it'll make it into a future post though, we'll see. 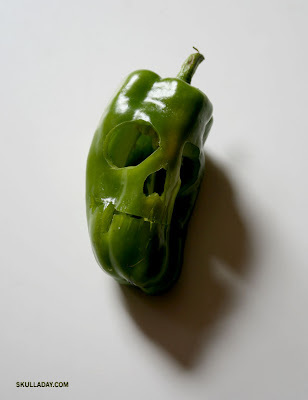 Carved Organic Bell Pepper (from my CSA: Sprout). I didn't realize it when I was making this, but I guess I subconsciously made this in response to Terry's recent pepper themed Bent Objects post. Acrylic (still wet) on Cement (24" x 24"). 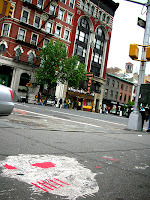 I've seen a form of paint drizzle graffiti on sidewalks around NYC and I wanted to give it a go. I only had a few tries to figure this out before I ran out of paint and workable space. Arranged and Cut Found Crushed Plastic Soda Bottle, Bottle Caps, Soda Can Tab. I found the bottle in the parking lot of a local art gallery recently and the other pieces on my bike ride through town today. 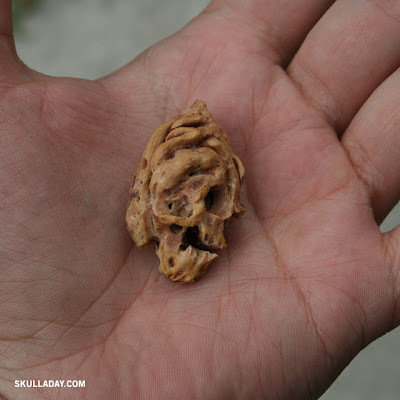 I am constantly amazed at the things I'm willing to touch in the name of making skulls. 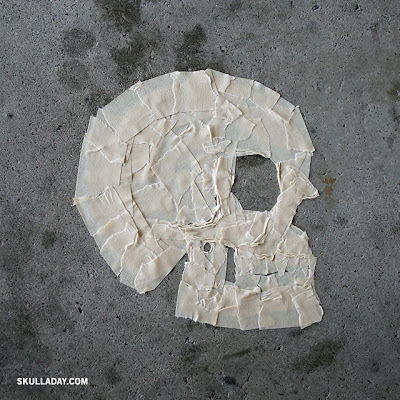 Hand Torn Masking Tape on Cement. 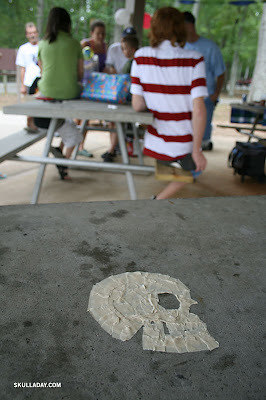 I was at a pirate themed birthday party for a friend's son in a park in southern Virginia today. After setting up the decorations in the picnic shelter I found myself with a roll of masking tape and some time on my hands so I left this on one of the tables. 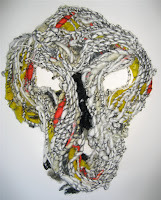 Linda discovered this skull in her handspun yarn! Tony made this excellent illustration! T.W. sent in this awesome picture of a 20's/30's car turn signal! 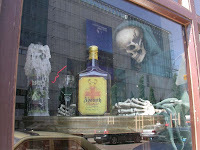 Kris and Christian captured this spooky image in Leipzig! 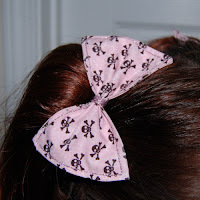 Krissy Sandvik made these lovely hair clips (be sure to check out her other fabric work as well)! West Schomer carved these wicked cool skull beads out of bones purchased at a pet store using a Dremel tool! Mica found this cool eco-skull available on T-shirts and Stickers from Eco-Noize. 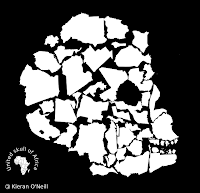 Kieran O'Neill was inspired by the United Skull of America to create the United Skull of Africa! Previously: United Skull of Europe and United Skull of Latin America. Angela and her boyfriend discovered this cute skull while playing with glowsticks. Gerry found this guy hiding on a ship in the Hamptons. 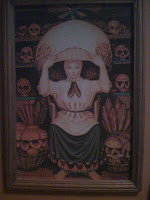 Nora spotted this image in a bathroom of Por Que No? Taqueria in Portland, OR. Szablocs sent this excellent picture from Romania! Kaitlen reminded us of the classic "All Is Vanity" illustration by Charles Allan Gilbert. Beonder 13 said "the kids around the corner had this in their driveway". A second giant, Lego man has been fished out of the sea in the Dutch resort of Zandvoort. Workers at the same drinks stall rescued the second 2.5-metre tall model, which had a skull head and skull picture torso. "Here we go again I thought as we saw something bobbing about in the sea again and we decided to take it out of the water," said a stall worker. "It was another giant Lego toy, although this one was a bit creepier then the last"
A woman nearby added: "This is the second time this week that one of these has washed up. It is beginning to look like Easter Island around here." The toy was later placed in front of the drinks stall next to the other. The worker added: "I am still waiting the thing to crack open and 1,000 little lego men to jump out and kill us in our sleep, like in that movie Troy." Seashell cut with Dremel tool. This chart was inspired by a recent submission by Anthony whose student Margriet Palm created an unintentional skull in a diagram she made to show "a biochemical network that we have artificially evolved to act as an 'exclusive disjunction' gate." Got that? 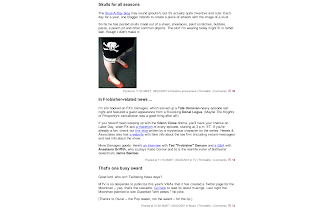 It's really quite lovely and it'll get an official post in a few weeks, but you can get a sneak preview HERE. P.S. You must go and watch the videos on my friend Amblus's post about metallic rock'em sock'em skull robot fighting pens and um...pie. Seriously do it now. 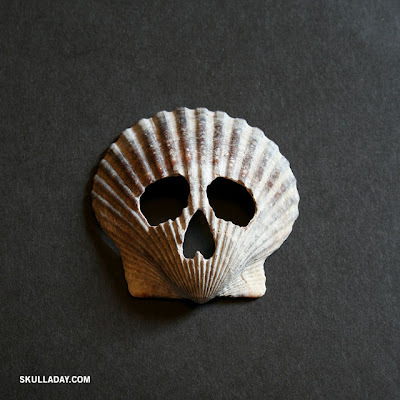 "The Skull-A-Day blog may sound ghoulish, but it's actually quite inventive and cute: Each day for a year, one blogger intends to create a piece of artwork with the image of a skull. 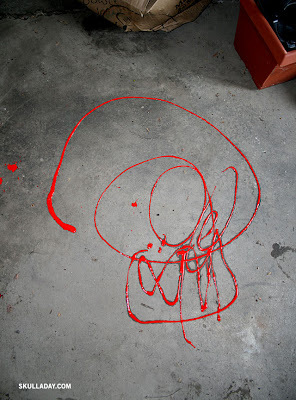 So far he has posted skulls made out of a sheet, shoelaces, paint scratches, bubbles, pasta, a peach pit and other common objects. The skirt I'm wearing today might fit in rather well, though I didn't make it." 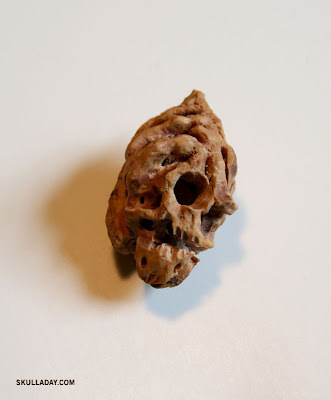 Peach Pit Carved with Dremel Tool. My grandfather used to carve peach pits so I did this one is in honor of him. 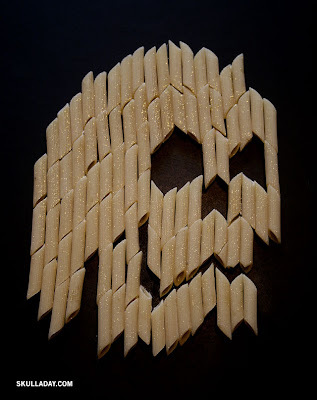 Arranged Uncooked Organic Penne Pasta and Glue. 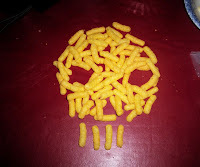 Yet another flashback to preschool art, this came from a suggestion by my friend Tere near the beginning of this project to make a macaroni skull (and heck I might still make one with macaroni noodles, who knows). I must resist the urge to spray paint this gold. P.S. I've been Yahooed! 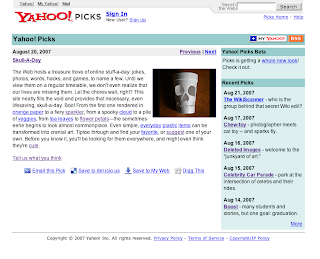 Skull-A-Day was chosen as a Yahoo! Picks selection yesterday! 1 piece of cut & folded 24 gauge sheet steel (folded size approx 6" x 9" x 4"). An extra huge thanks goes to Philip who let me use his workshop and materials, gave advice on how to accomplish this piece, and welded the seams for me! 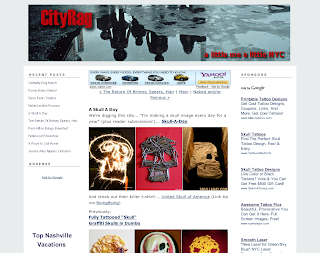 "The Web hosts a treasure trove of online stuff-a-day: jokes, photos, words, hacks, and games, to name a few. Until we view them on a regular timetable, we don't even realize that our lives are missing them. Let the chores wait, right? 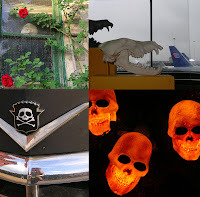 This site neatly fills the void and provides that necessary, even lifesaving, skull-a-day. Boo! From the first one rendered in orange paper to a fiery sparkler, from a spooky cloud to a pile of veggies, from tea leaves to flower petals—the sometimes eerie begins to look almost commonplace. 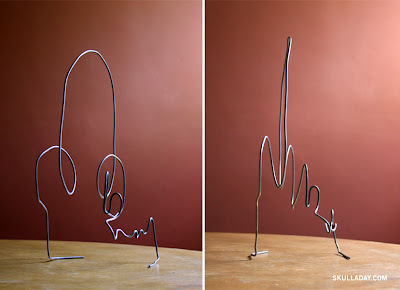 Even simple, everyday plastic items can be transformed into cranial art. Tiptoe through and find your favorite, or suggest one of your own. Before you know it, you'll be looking for them everywhere, and might even think they're cute." 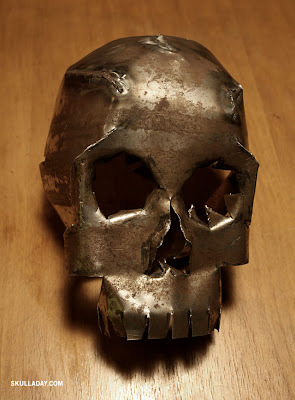 "We're digging this site... "I'm making a skull image every day for a year" (plus reader submissions!)... 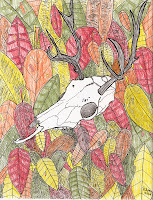 Skull-A-Day"
Arranged Sheet. I left this in our hotel room in Winston-Salem this morning. 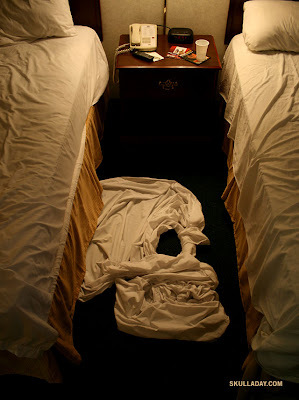 I wonder if the cleaning staff noticed. 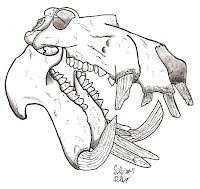 Silas, a tattoo apprentice in Georgia, made these two lovely animal skull drawings. Renata spotted this great tomb marker while visiting the Etruscan Museum in Volterra. 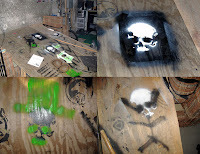 Glen C. had some fun with the Skull Stencil on a basement ramp. 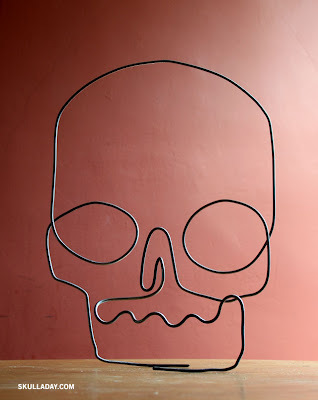 Shazam from France made this awesome "Curly" Skull. 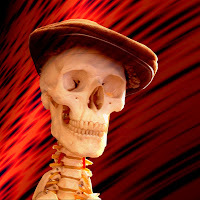 And says, "As a former punk singer, I had a real skull in my bedroom for a long time, but one night I decided to put it back to the soil, so I burried it just beneath the Eiffel Tower in Paris..."! 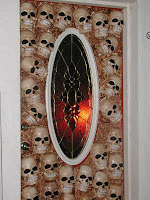 Mark Jones made this incredible Skull Door for Halloween last year. Here are his directions if you're interested in making your own, " I used a vacuum former to make multiple skulls from styreen. They are mounted on panels with magnets to grab the metal door. The stuff filling the gaps is expanding foam. Paint to add creepyness, and there you have it." Jonathan & Eva sent in this simulacrum image from the Fortean Times. 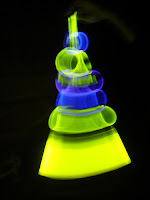 Bob Conge from Plaseebo created this wicked cool (glow in the dark!) 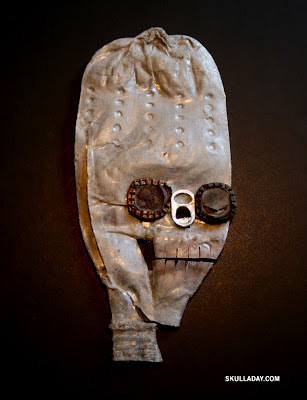 skull mummy. 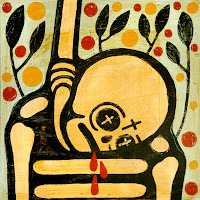 Mike Egan makes awesome paintings, many of which contain skulls. So awesome that I actually bought this one! My friend Kenny Hamilton is also a terrific painter. I wonder if he'll sell me this. Tiki Chris pointed me to his super-cool Skull Mask Project. I can't wait to see the results! Ralf introduced me to his dapper friend Basil. 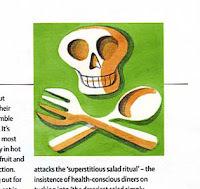 My friend Jessica spotted this illustration in Telegraph magazine Stella. 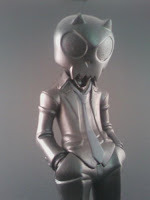 Matt Weekly created this damn fine looking Mr. Toy2r custom. k sent this sweet image of skull love. Zombie37 spent a sick day at home adding "skulladay" to their Flicker photos! 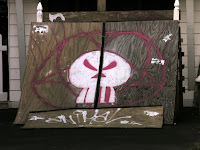 P. spotted this great skull in NYC last Spring. 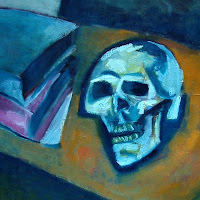 Thanks again to you all, it's a real treat getting surprise skull e-mails throughout the week! And a big thanks to everyone for their book suggestions! Next up, I need to get some contacts with publishers (I've been told cold calling is no good) and prove this project is popular enough to warrant a book! 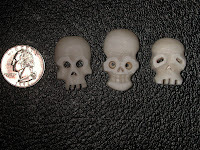 Finally, an update about the Shrunken Skulls created for the Art-O-Mat 10th anniversary swap meet event in Winston-Salem, North Carolina. I went down with 50 Saturday morning and came back this afternoon with just 8! 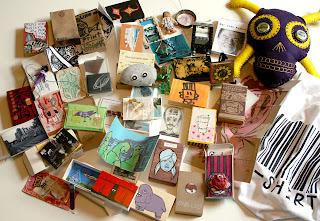 The majority I traded for other Art-O-Artists' work (see my new art collection featuring 3 skulls below). I also met plenty of great folks (including fellow artist Herbert Hoover, showing off his skull ring below) and had an all around terrific time. So how can you get one of the remaining 8 Shrunken Skulls? I'll let you know soon!